So simple to create at home, Bitters and Shrub Syrups will add an incredible depth of flavor to any beverage.Historically, cocktail bitters, drinking vinegars, and even infused syrups were originally used for curing sickness with high concentrations of beneficial (healing) herbs and flowers. The slight alcohol base of bitters kept the often-fragile ingredients from rotting in the age before refrigeration. Bitters in the modern cocktail bar are embraced as concentrated and sophisticated flavor agents, although they are still used in holistic healing by herbalists. Shrubs add both tart and sweet notes to a craft cocktail or mocktail. They sate your hunger and quench your thirst, while stimulating digestion and good health of the gut.The Cocktail Whisperer, Warren Bobrow, has been using bitters and shrubs in his quest for added zest in many of his craft cocktails, adding depth and mystery to a generic mixed drink.Bitters and Shrub Syrup Cocktails will send your taste buds back in time with 75 traditional and newly-created recipes for medicinally-themed drinks. 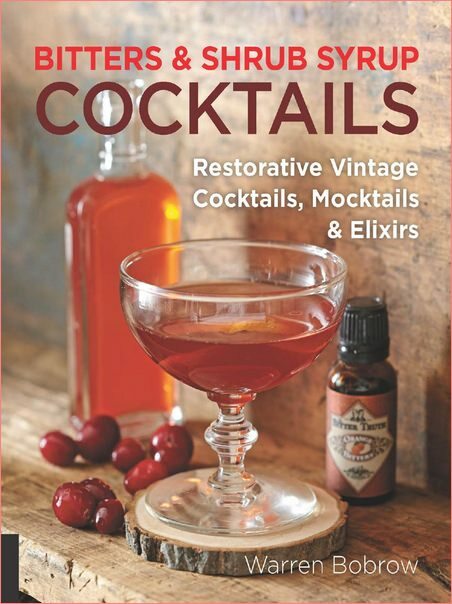 Learn the fascinating history of apothecary bitters, healing herbs, flowers, fruits, vegetables, and vinegars that are making a comeback in cocktail and non-alcoholic recipes. If you love vintage cocktails, you’ll surely enjoy this guide to mixing delicious elixirs.